Many visitors to our website have requested we compile a bibliography of all the books and videos that we are aware of (or made aware of) that relate to the Aleutians or to WWII in the Aleutians. The first two books one should read include a definitive book written by Brian Garfield, "The Thousand Mile War," and a book I captured from e-Bay entitled "The Capture of Attu" (I was first made aware of this book through Rene Thibault, a WWII Attu Vet and contributor to this web site, who shared with me his personal paperback copy obtained in the closing days of the war). Each of the additional books provide insights from different perspectives that when taken in their totality provide an excellent and complete picture of life in the Aleutians before, during, and after WWII. If you have additional items relative to these events, please e-mail your contribution, and I'll add them to the page. Attu Boy by Nick Golodoff, with Rachel Mason, Editor, 2012. Copies of this book can be obtained by contacting Greg Dixon, Cultural Resource Technician, Cultural Resources Team, Alaska Regional Office, at (907) 644-3465. 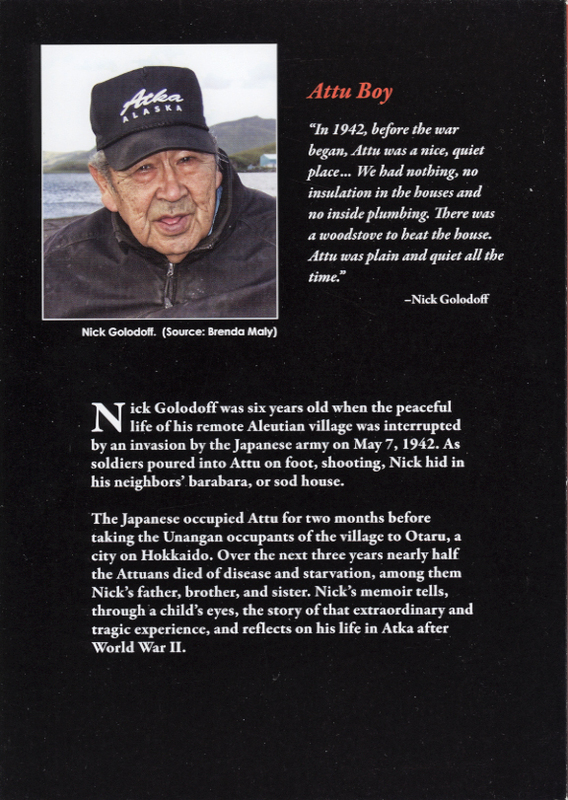 The National Park Service is pleased to make available the story of a young boy's experiences as a Japanese captive and intern during WWII, and of his resettlement in Atka after the war. For those of us who'd wondered about life on Attu just before WWII and during the initial Japanese invasion and capture of Attu and its inhabitants, as well as their lives spent in captivity in Japan during the war, this book is a must read! It is replete with numerous black and white as well as color photos, maps, and charts of Attu and its inhabitants of that time. Call or write the contact info provided above for your copy today! The Thousand Mile War by Brian Garfield, 1995. Etta Jones, my great-aunt, was the first female Caucasian taken prisoner from American soil by a foreign enemy since the War of 1812. The historical incident took place in June, 1942, when the Japanese invaded Attu, Alaska, the westernmost island in the Aleutian Chain. Until now, the sequence of events leading up to her capture as well as her experiences in Japanese POW camps for thirty-nine months have never been accurately documented. Hers is a story of incredible bravery and courage when faced with adversity. Mary Breu. 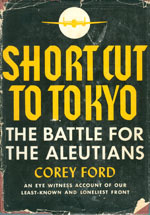 Shortcut to Tokyo, The Battle for the Aleutians, Corey Ford. This was a welcome Christmas gift to me from my wife this year (2010). A quick read as there are only 141 pages to this book. It was published in New York by Charles Scribner's Sons in 1943, selling then for $1.75. Ford details flights from then not-identified islands (would be Umnak, Adak and Amchitka) on their way to bomb Kiska...then held by the Japanese. 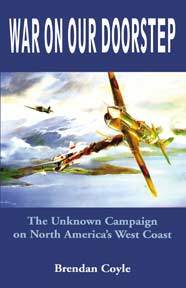 On a personal level, this book gets close to the missions, the pilots and crews of the medium and heavy bombers, the rescue aircraft, as well as the "pea shooters," as they lived, flew, and fought in the Aleutians up to 1943. Additional chapters looks back at visits by Ford to the Aleutians prior to the war breaking out, a brief history of the Aleutians and the Aleuts, and discusses suspicions the Aleuts harbored about the many Japanese visits to the Aleutians just prior to the outbreak of WWII, talks about Attu Chief Mike, the sea otters, vegetation, and bird populations of the Aleutians. A quick look and comparison at the end of the book into the lives of two men...one a union factory worker in the USA building the planes, and another look at an Aleutian AAF pilot flying bombers made by him...and their mutual desires and hopes for their families. Might bring a tear to your eyes. Book is hard to find...I found one used copy on Amazon.com, who referenced Abebooks. Worthwhile obtaining and reading! Center of the Storm The Bombing of Dutch Harbor and the Experience of Patrol Wing Four in the Aleutians, Summer 1942 by Jeff Dickrell. ISBN 1575100924. Available from the Museum of the Aleutians Store in addition to other booksellers. Call 907-581-5150 to get your copy from the Museum (Jeff donated the whole package to the museum). Jeff Dickrell arrived in Unalaska, Alaska in 1990 from Naperville, Illinois, to teach high school history. Immersing himself in Aleutian history, especially the WW II era, he is a board member of the Museum of the Aleutians and a researcher for the National Park WW II Interpretive Center in Unalaska. An annual class trip to Washington DC allowed him much access to the National Archives Still Picture Division. In 1997 and 1999 the Patrol Wing Four Association invited Jeff to their reunion where he had a chance to meet with the many veterans he had been corresponding with for this book. He continues to enjoy the friendships made there. Jeff has a B.A. in history from Northern Illinois University. When not in front of a class or his computer, he can usually be found paddling his kayak or hiking the hills of Unalaska. The true story of a war (with sixty photographs) that was kept from the American people, a war fought right in its own backyard from June 1942 through September 1943. It tells of how the governments of both the United States and Japan tried to keep a part of WWII secret and how it was years before citizens had any idea it ever happened. It's a story of love, faith, and hardships, suffering and dying...from a perspective seen by both sides of the conflict. Who does remember today that during Word War 2, the Aleutians were an advanced theatre of operations against Japan? As a diversionary move in conjunction with their strike against Midway, the Japanese bombed Dutch Harbor in June 1942 and landed troops on Kiska and Attu, the westernmost islands of the Aleutians. The Japanese remained, primarily in a defensive situation, to prevent any movement by American forces toward Japan through the Aleutians chain. Aerial operations by Japan and by the fighter and bomber units of 11th Air Force were often restricted by severe weather. The 15 months of the campaign turned out to be a struggle against nature rather than against rival enemy forces! The 11th Air Force knew many losses, in most cases, caused by accidents. P-38s, P39s, P-40s, B-24s, B-25s and B-26s led continuous attacks on Japanese installations. 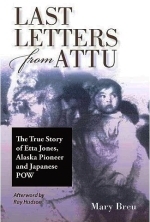 In May 1943, American forces seized Attu after a bloody battle. First step to the recapture of the Aleutians and to the raids against the Northern Kuriles, the Japanese home islands. This subject which remains unknown to many will be done in two parts in "Ciel de Guerre" by Arnaud Prudhomme and St�phane Soulard. [Note: This quality magazine is loaded with great photos, battle maps, drawings of aircraft serving in the Aleutian Theater of War, tables of aircraft and related information, along with personal stories...printed on heavy glossy paper. 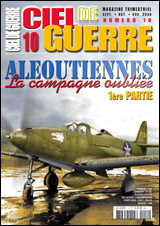 While printed in French it is an excellent reference source for those interested in Aleutian WWII history. You will find some of this web site's photos and stories in this magazine. This magazine is primarily available in Europe, but you can get a copy of your own through PayPal. For more information, and to get a copy of this magazine, click HERE. 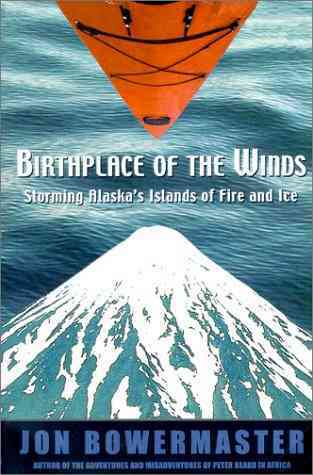 Birthplace of the Winds - Storming Alaska's Islands of Fire and Ice by Jon Bowermaster. Hardcover (February 2001) National Geographic Society; ISBN: 0792275063 ; Dimensions (in inches): 1.04 x 9.26 x 6.29. Currently $26.00 new or $13.90 used (6-30-01) at Amazon.com. Review by Russell Marvin: "The book is an account of a 25 day kayaking and mountaineering expedition by the author and 3 of his friends through the Islands of Four Mountains, a group of Aleutian islands located about 150 miles west of Dutch Harbor. In addition to a narrative of his highly dangerous trip, Bowermaster gives a lot of very interesting information on the life of the original Aleut inhabitants of these islands. Good reading for the armchair adventurer." 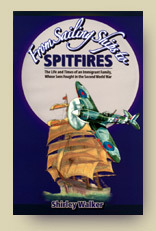 From Sailing Ships to Spitfires by Shirley Walker. Paperback (ISBN 0888872879) or Hardcover (ISBN 0888872895), the life and times of an immigrant family, whose sons fought in the second World War. Available from Borealis Book Publishers. Includes a section on Canada's involvement in the Aleutian theater during WWII. Click HERE to read extract (PDF file). Also see Shirley's web site by clicking here. The Lockheed P-38 Lightning by Warren M. Bodie, Widewing publications. 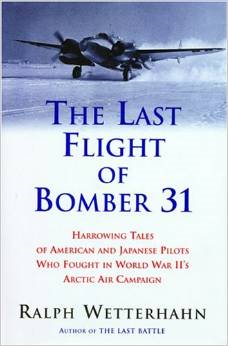 Bob Freeman highly recommends this book for those interested in the P-38's WW-II history in the Aleutians. The Dutch Harbor Attack, June 3-4, 1942. The Japanese attacked Dutch Harbor during the early hours of 3 June, 1942, and again in the afternoon of 4 June. These two attacks were but small parts of a large overall plan to take the island of Midway, draw the U.S. Pacific Naval Fleet into a decisive battle at sea, and to occupy the outer islands of the Aleutian Chain. This book tells the story of the Dutch Harbor attack from both the American and Japanese points of view. Kept secret for morale and security reasons, the Japanese attack and ultimate invasion of the Aleutians was off limits to the American press. Published by University of Alaska Press (Fairbanks), distributed by University of Chicago Press, to be published September 2014. 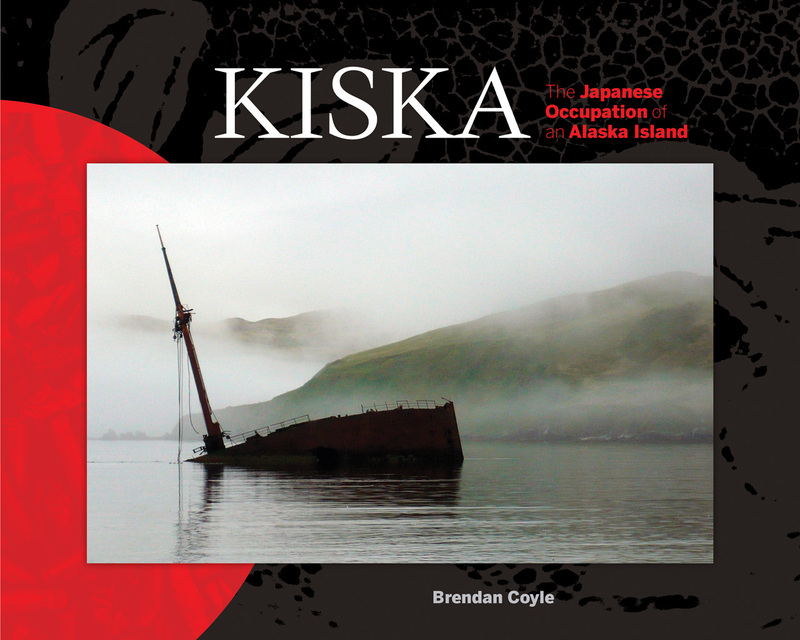 Brendan Coyle's upcoming new book records 51 days in 2009 spent camped on Kiska while surveying the island for signs of the Japanese occupation. ISBN: 1-894384-46-6. The first enemy occupation of U.S. territory since the War of 1812 occurred when Japanese troops stormed the Aleutian Islands in 1942. Bloody conflict raged through the following years, as American and Canadian troops defended the northern front. As the war continued, a Japanese airplane dropped bombs on Oregon, while submarines lurked off Washington and British Columbia. Using the westerly winds as an ally, Tokyo directed a battalion of balloon-bombs that drifted to North America's coast and randomly wreaked havoc. War on our Doorstep presents the fascinating history of a war largely hidden from the public as governments attempted to avert panic from California to Alaska following the bombing of Pearl Harbor. Sixty years later, the fascinating events of that era and their impact on both the American and Canadian psyches remain virtually unknown to much of the world. After conducting decades of research and interviews with veterans on both sides of the conflict, author Brendan Coyle reveals details of the previously unknown campaign that included attacks on Oregon, British Columbia, and the harsh battles fought in Alaska. Coyle's captivating 240-page account includes over 110 photographs and maps, which document the era and events. A lavishly illustrated work records the amazing reclamation of a fleet of American World War II warplanes buried in ice in Greenland since the war and recovered by two amateur aviation enthusiasts. 35,000 first printing. This book is currently out of print with limited availability (28Dec02), but might be found on Amazon.com. This book was recommended by Harry Higgins, WW-II P-38 Pilot Extraordinaire. Mitsuo Fuchida was the career aviator who led the attack on Pearl Harbor and participated in the most fiercest battles of the Pacific war. A valuable record of major events, his life's story is also one of a man swept along by his times. 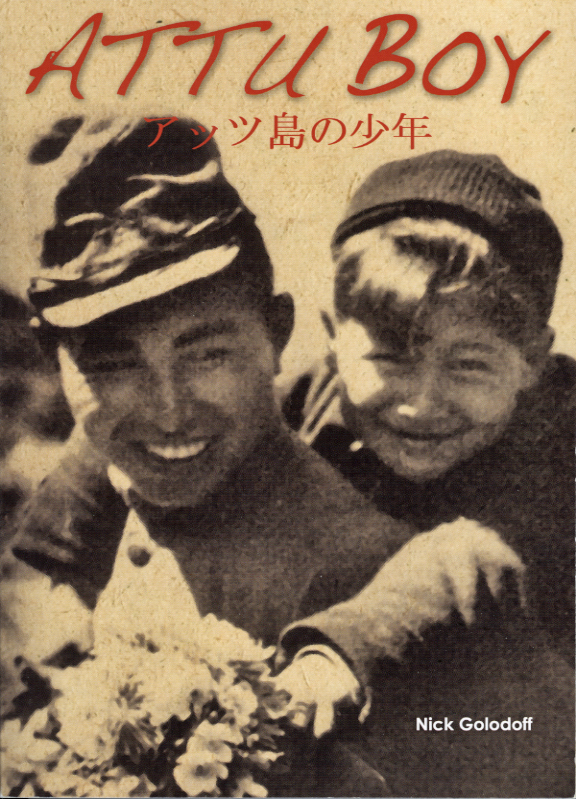 Reared in the vanished culture of early twentieth-century Japan, war hero Fuchida returned home to become a simple farmer. After a scandalous love affair came his remarkable conversion to Christ and years of touring the world as an evangelist. God's Samurai is a revealing, personal look at both the war and the century from the Japanese perspective. Available from Amazon.com (see link below). For additional information, click HERE. These entries are from Wendy Svarny-Hawthorne. We thank her immensely for her contributions to our Bibliography page. These are books about the Aleut and other tribal peoples of Alaska. 0-295-97403-6. The late Professor Kohlhoff has assigned his royalties from this publication to the Aleut educational program of the Aleutian/Pribilof Islands Association. Unangam Ungiikangin Kayux Tunusangin * Unangam Uniikangis ama Tunuzangis * AleutTales and Narratives, collected 1909-1910 by Waldemar Jochelson, edited by Knut Bergsland and Moses L. Dirks. Published by the Alaska Native Language Center, College of Liberal Arts, University of Alaska Fairbanks in 1990, ISBN1-55500-036-3. This is a collection of wax cylinder recordings of storytellers in the years stated that have been carefully transcribed and translated by the editors in both the Aleut language (Unangam Tunuu) and in English. There is a lot of historical background presented, and quite a few pictures. The Ethol�n Collection: The ethnographic Alaskan collection of Adolf Ethol�n and his contemporaries in the National Museum of Finland, by Pirjo Varjola with contributions by Julia P. Averkieva and Roza G. Liapunova. Published by the National Board of Antiquities of Finland. Sorry, there is no ISBN or other publication information for this, but I've seen this book in a lot of museums in the US. A little spendy, but it's a beautifully photographed record of the collection from all tribes in Alaska. The section on the Aleut has some really nice examples of traditional clothing, bentwood and other headgear, basket weaving, and ivory carvings. The Winds of War NBC Dateline, Shane Bishop Producer. A story about two unlikely participants engaged in the Battle for Attu. Click HERE to visit NBC web site. Alaska At War Through rare Japanese and American film footage, you'll see the rugged, inhospitable conditions under which this dramatic campaign was fought and the heroism of U.S. and Japanese soldiers in combat. Winner of the CINE Golden Eagle Award for excellence. Approximately 60 minutes. Click HERE to visit Alaska Video Publishing's online store, where you can also find other videos relating to Alaska. You can also call them at 800-770-4545 to order videos direct. The Cradle of Storms Tells the story of a beautiful and raw land and its people who have endured and survived wave after wave of invaders and a relentless, unpredictable climate. The Aleutian Islands span the seas between Alaska and Siberia, a desolate necklace of wind-stripped terrain, ravaged by weather that has earned it the name "the cradle of the storms." It is also home to a vast and impressive array of wildlife. The first episode reveals the storm-lashed islands and the 9,000-year-old culture that was forever changed by fur-seeking outsiders, first by Russians then later by Americans. The second episode picks up the story of the native Aleuts as the violence of World War II arrives on their islands. Even in the face of such devastation, the Aleutian people endured and thrive today. Click HERE to go to the linked site. To purchase the books referenced above, try AMAZON.COM! In the "Amazon.com" box, try typing in "Attu" in the Amazon.com keyword box, and see what shows up! Also, you can enter the books ISBN number in the "Keywords" box, click on "GO!" and you should be taken directly to the book you're looking for. They have great price reductions on most books, and can also order "out of print" books for you.